Despite the lack of verifiable information at this stage, the various sides have already begun to place the blame and put forward their scenarios for the disaster. The authorities of the unrecognized People's Republic of Donetsk have denied any involvement in the crash of the Malaysia Airlines plane. "The militias do not have weapons that are capable of shooting down a plane at an altitude of 10 kilometers [33,000 feet]. We have portable anti-aircraft missile systems that can shoot down aircraft at a maximum of 3-4 kilometers [10,000-13,000 feet]," announced Sergei Kavtaradze, representative of the Donetsk Prime Minister, blaming the plane crash on the Ukrainian Army. Ukrainian President Petro Poroshenko has labeled the crash a terrorist act, according to his press secretarySvyatoslav Tsegolko. "Poroshenko on downed plane: This is not an accident, not a catastrophe, but a terrorist act," wrote Tsegolko in his Twitter microblog. The Malaysia Airlines Boeing 777 crashed on Thursday, July 17 in the Donetsk Region of Ukraine territory, en route from Amsterdam to Kuala Lumpur. Aboard were 283 passengers and 15 crewmembers. 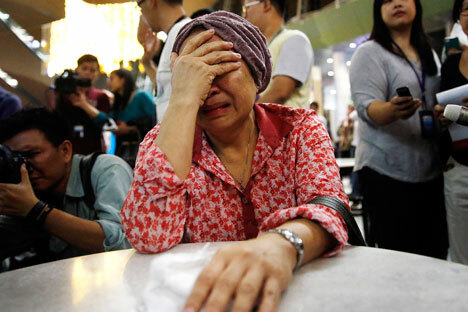 According to the airline, there were 154 Dutch, 27 Australians, 23 Malaysians, 11 Indonesians, six British, four Germans, four Belgians, three citizens of the Philippines and one Canadian. The nationalities of the 41 other passengers have still not been determined. According to some accounts, there were 23 Americans among them. All 15 crewmembers were Malaysians. "The Ukrainian president's administration has announced that the airplane could have been shot down from Russian territory and emphasized that government forces did not carry out any activities related to the shooting down of aircraft in the area of the crash," he continued. In a statement released by Poroshenko’s press office, the Ukrainian president accused Russia of supplying “military personnel and state of the art weapons” to the pro-autonomy miltias in the east of Ukraine and made it clear that he saw the hand of Moscow behind the incident. “Following the effective operations of the Ukrainian Army, the mercenaries and their ‘big brother’ are resorting to the use of unconcealed military action against our state with increasing frequency and brazenness,” said Poroshenko. According to a statement by Russian President Vladimir Putin, Ukraine bears responsibility, but notas the party who pushed the button,but for permitting civilian flights over a war zone. “I would like to note that this tragedy would not have occurred if there were peace in that country, or in any case, if hostilities had not resumed in south-eastern Ukraine,” Putin told his assembled advisers after observing a moment of silence for the flight’s passengers, reported RIV Novosti. “And certainly, the government over whose territory it occurred is responsible for this terrible tragedy,” the Russian president added. “The head of the Russian state emphasized that the tragedy that occurred once again confirms the necessity of a quick peaceful settlement to the acute crisis in Ukraine and said that all of the circumstances around the aircraft disaster need to be investigated carefully and objectively,” the Kremlin’s press service said, according to RIA Novosti. A lot of debate has revolved around the particular kind of anti-aircraft weaponry used to bring down the airliner. Ukrainian Foreign Ministry advisor Anton Geraschenko has said on his Facebook account that the plane was shot down by a BUK anti-aircraft missile system, which many observers are claiming may have been one that was captured by militias in the Donetsk Region in late June. However, Ukraine's Prosecutor General Vitaly Yarema, in an interview with the Ukrayinska Pravda online newspaper, said that to his knowledge the militias in the self-proclaimed People's Republics of Donetsk and Lugansk do not have the BUK or S-300 anti-aircraft missiles at their disposal. "After the shooting down of the passenger airplane, the military informed the president that the terrorists do not have our BUK and S-300 missile systems," said the Prosecutor General. "These weapons were not captured." Meanwhile, Russia's Defense Ministry has announced that on July 17 Russian radio technical devices recorded the activity of the 9c18 radar station of a BUK-M1 anti-aircraft missile system battery, which was deployed in the vicinity of the settlement of Styl, 19 miles south of Donetsk. The ministry said that the BUK M-1 anti-aircraft system's technical specifics permit the exchange of information on air targets among batteries from the same division. The Russian Defense Ministry emphasized that the missile, therefore, could have been launched from all batteries deployed in the settlement of Avdeevka (5 miles north of Donetsk) or in Gruzko-Zoryanske (15 miles east of Donetsk). "The Russian army does not have the BUK-M1 anti-aircraft missile systems, which the mass media say were used and whose photographs are being actively published,” said Russian army colonel and independent military expert Viktor Litovkin. “Our army is armed with the BUK-M2 anti-aircraft missile systems, which even someone unversed in military affairs can distinguish from the BUK-M1. Actually, it is Ukraine that has the BUK-M1 missiles." He noted that the BUK-M2s can be found on the Russian-Ukrainian border. However, the plane was shot down at a significant distance from Russia, while the BUK-M2's capacity is limited to 19 miles. "The Boeing 777 fell at a distance of 50 kilometers [31 miles] from our border. And the plane was not destroyed in the air, but glided down almost 100 kilometers before falling. Witnesses saw that it did not break apart in the air, but crashed into the ground," said the expert. Russian publication Dni.ru quotes the press office of the self-proclaimed People's Republic of Lugansk as saying that the Boeing 777 could have collided in the air with a Ukrainian SU-25. "Witnesses saw the Boeing 777 being attacked by the Ukrainian Air Force jet, after which the passenger plane broke in two pieces in the air and fell onto the territory of the People's Republic of Donetsk. Currently, a search of the shot-down aircraft is being carried out," writes the publication, quoting the unrecognized republic’s press office. An individual named ‘Carlos’ who claimed to be Spanish and allegedly works as a dispatcher at Kiev’s Borispol Airport, wrote on his Twitter account that two Ukrainian Air Force planes were spotted next to the airliner a few minutes before the crash. "The military planes were flying next to the 777 three minutes before it disappeared from the radar, only three minutes," wrote the man on his Twitter account. "When the Boeing disappeared from the radar, the Kiev government told us that it crashed. How could they have known so soon?" The account of ‘Carlos’ was later cancelled, though the cached version can be seen here.